This week is National Vocations Week. I would like to reflect on that briefly, and about sacrifice, presence, and fulfillment. As a seminarian, each of is assigned a different pastoral assignment. I am lucky this year, I get to be assigned to Saint Joseph’s Hospital in Paterson, NJ. Here, working under the supervision of the Department of Pastoral Ministry, each seminarian gets to take turns visiting the various departments of the hospital and ministering to the patients. Recently, I was assigned the behavioral health department and I asked to sit in during a group therapy session with the patients currently undergoing treatment in the unit. Two young women were admitted for drug addiction, alcohol addiction, and psychological issues. While they were speaking, they were a voicing frustration about the lack of support they felt they did not get with their friends and loved ones as someone suffering from addiction and mental illness. They began to state they will no longer trust anyone anymore, for when you trust someone, all you do is get hurt. It might be easier for us who do not have these heavy crosses to write these young ladies off because they suffer from these crosses, they simply do not get life, or it is their own moral failings that led them to their current state. But the social workers running the group were greatly skilled in these matters, and they helped the ladies face the issue. What I did not expect was they used Christian concepts to help them understand themselves and the situation much clearer. The social workers acknowledge that someone undergoing treatment for these things is no different than being hospitalized with broken legs and learning to walk again. Going through rehabilitation is a traumatic thing and looking for friendships and psychological intimacy immediately upon discharge is probably not a good idea. Seeking professional and group help, however, is a great idea, and making sure you take care of yourself. Finally, and most importantly, every friendship involves sacrifice and fulfillment. If you do not risk being hurt, you do not open yourself up to being loved. The social worker really was talking about redemptive suffering, which is a Christian concept. I was thrilled to hear it, because we do not talk about it enough today. We love to talk about the things that bring us joy, but not about the pains that we endure to get there. I think we can gain tremendous grace from this. 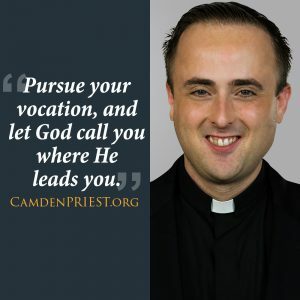 When discerning a vocation, we can think of many reasons, experience many fears, create many mental images of us either unable or unwilling to put in the sacrifices to pursue a Christ-like vocation in marriage, single life, religious life, and especially priesthood. Perhaps we are considering marriage, but we can’t help hearing the voice in our head saying, “I do not want, or I cannot sacrifice my independence.” Maybe we are afraid of a marriage ending in divorce or separation. If we consider the priesthood, the biggest fear might be can I live the rest of my life without a wife and family? Am I willing to sacrifice a wife and family for the sake of people (The Body of Christ) I might not know very well? I think the important thing for us to do in discerning these vocations is to ask God to take us back in prayer to times in the past where we felt as we feel right now. Ask God, how did I feel then? What was going on? What pressure did I feel? Where were you, God, in this? For me, I think I find that God prepared me in meeting people, loving people, and letting them go back to God when I was very young. I do not own people; all people belong to God and not me. God was there and a consistent presence in a time of my life when I lacked a consistent presence that was very needed. It is here God takes me in my prayer, and I draw strength from this. It is in this sacrifice, that I often see the beauty of humanity and human nature. It is in the sacrifice that I make in letting people go to God directly, and not to me directly that I see Christ in His creation. Do not be afraid. Let God take you where He gives you strength. Pursue your vocation, and let God call you where He leads you.